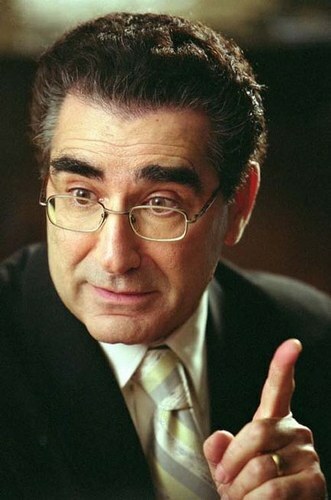 Eugene Levy (born December 17, 1946) is a Canadian actor with a long and illustrious career as a comedic actor. Best known in his early career for playing hapless geeks and sleazy losers, he's broadened his niche to include Cool Old Guy roles through his involvement in the American Pie franchise (of which he's the only actor to appear in every single installment). Levy is part of the Production Posse for Christopher Guest, appearing in major roles in each of Guest's theatrical improv films. Recently, he has become best known for the sleeper hit Schitt's Creek, which he co-created with and stars alongside his son Daniel Levy and plays opposite his frequent collaborator Catherine O'Hara. SCTV: Where Levy became well known. Like the entire cast, Levy played many characters on the show. Along with John Candy, he played one half of the Schmenge Brothers, a pair of Leutonian polka-playing brothers with strange customs and tastes in food. Possibly his best-known role on SCTV was one half of the news team as the Kind Hearted Simpleton Earl Camembert, a not-especially-bright reporter with some bizarre habits that had to be kept in line by his co-anchor. American Pie series: Noah Levinstein, "Jim's Dad"
Big Ol' Eyebrows: Truly majestic. Just look at the page image. Cool Old Guy: His American Pie roles helped him to add this trope to his repertoire. Fake American: He's Canadian, but most of his characters are American. The Glasses Gotta Go: Both Eugene and his son Dan are known for wearing dramatic eyewear, but their fictional counterparts on Schitt's Creek do not, making it easy to distinguish between photos of the real men and their characters. Improv: Started at Second City, and he's done several improvised films with Christopher Guest. Production Posse: He's part of Christopher Guest's posse, appearing in all of his theatrical improv films. Playing Against Type: Former business mogul Johnny Rose of Schitt's Creek is confident, successful, a Sharp-Dressed Man and women find him genuinely attractive. Sure, he occasionally has awkwardly supportive moments with his adult children, but he is still a departure from many of Levy's famous characters. Polka Dork: Plays the accordian in real-life and has used this for comic effect more than once. Real-Life Relative: Works with his son Dan and his daughter Sarah, who plays Twyla, on Schitt's Creek. Those Two Actors: Has appeared opposite Catherine O'Hara multiple times over four decades. Also worked with John Candy multiple times. What Could Have Been: He was almost cast as Toby on The West Wing. Written by Cast Member: Co-wrote some of Christopher Guests films, co-created Schitts Creek with his son Daniel Levy.